This is a cooked tomato based soup. Many studies say that the nutrients and all the good things residing in tomatoes can be obtained better from cooked tomatoes than from the raw ones. This soup can be eaten hot or cold with more or less calories. Make your choice by the weather outside, your mood or the numbers on your scale in the morning. Peel and deseed the tomatoes (for instructions see recipe "Cold Tomato Soup with Poached Salmon Mousse" under Soups in this blog). Cut into smaller pieces of 1-2 cm. Peel the cucumber, cut out a bit of the seed section if the cucumber is very seedy and less fleshy, cut into similar smaller pieces. Heat the butter in a larger pan. The size of the pan should be enough for the whole soup to fit in. Fry the onions till they start to turn glassy and start to take a slightly brown colour. Add the flour and mix together. The flour and the butter will become quite solid together. Add the tomato pieces and mix with a spoon or wisk quite fast to get the flour mixed with the liquid from tomatoes and not clump. Add the cucumber, mix shortly and add the vegetable broth. Add the sugar, some black pepper, ca 10 turns from the pepper mill and taste for salt. Simmer at medium low temperature for 20-30 min. Do check on the soup every now and then and stir it to avoid the flour to burn at the bottom. 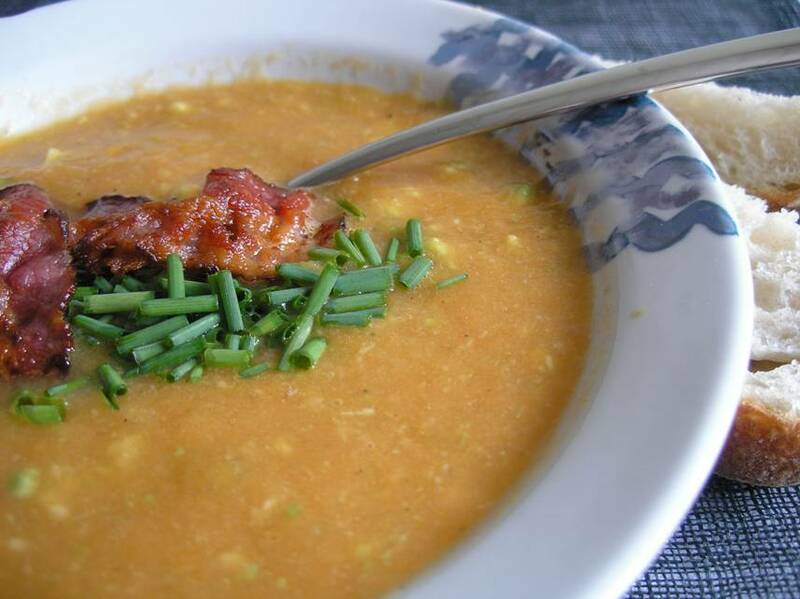 Using a blender, food processor or a mixer purée the soup into a smooth consistency. Return to heat and mix in the cream. If you want to eat the soup cold, cool it down and add the avocado into the cold soup. If you prefer it hot, halve the avocado and take out the soft part and mash a bit with a fork, mix into the soup. For a heartier version put a pan on the stove at medium-high heat, when the pan is hot put the halved slices of bacon on the pan and let the fat soften and melt out, turn the bacon to the other side, cook till it turns crispy. Pat the bacon dry with the kitchen paper to get excess fat off. Serve the soup with with chopped chives and slices of bacon on the top and fresh bread. For the healthier version you can leave out the bacon and /or the cream.